Billionaire businessman Dan Gilbert is the biggest private owner of office space in downtown Detroit, totalling 80 properties at 7 million square feet. Gilbert is also the Founder and Chairman of Quicken Loans and Rock ventures, home of a multi-million dollar private security hub which monitors the streets of Detroit. On July 1, 2014 Rock Venture's "watchmen" discovered footage of teenagers tagging an alleyway in Detroit causing Gilbert to launch a witch-hunt to find the vandals. Emailing blurry security images from the scene to all 12,500 of his employees along with a scathing message which described the perpetrators as "degenerates," who "crawl out of their deep dark holes and try to ruin it for the rest of us,” Gilbert encouraged employees to share the stills on personal social media networks to capture those responsible. Eventually, three high-school women were apprehended and charged with malicious destruction of property, the result of Gilbert's power and influence . 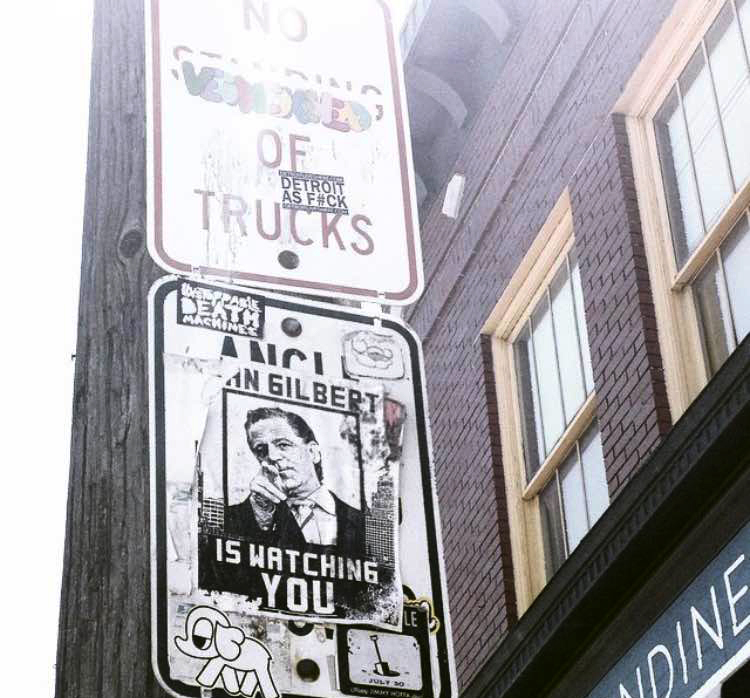 Dan Gilbert is Watching You was placed in areas in direct view of his security cameras.